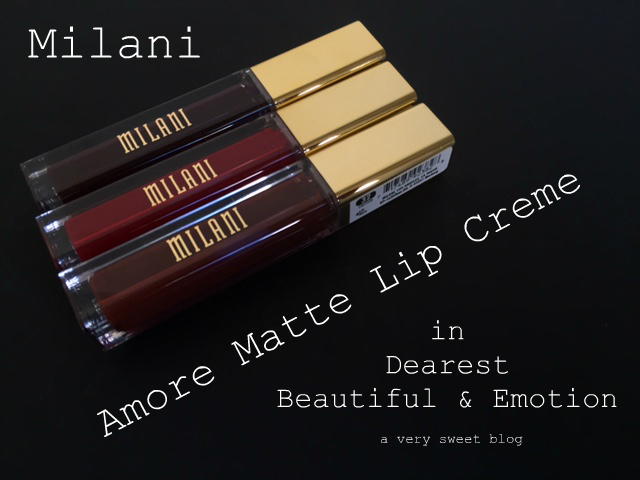 Sponsored: I was sent some Milani Amore Matte Lip Creme liquid lipsticks to review. I've reviewed a number of Milani products in the past and have been VERY pleased. But this year, I noticed a number of bloggers & YouTubers complaining about the formula of some of their newer products (foundation, lipstick etc.). I experienced several problems with these. The first problem I experienced was when I swatched the liquid lipstick on the back of my hand. If you look at my initial (hand) swatch, you'll notice they look good wet. However, when the colors dried down (middle hand picture) there was a lot of patchiness & unevenness. The second problem I experienced was with the packaging. I found there was way too much product dispensed on both the applicator and wand. When applying these to my lips, I had to be very careful not to apply too much (which was difficult & nearly impossible). This liquid lipstick applies very liquidity & thick and can be messy. The third problem I experienced, was getting EVEN COVERAGE! You're dealing with a liquid lipstick that dries super fast, but is patchy. So layering can be challenging. Matte lipsticks were all the rage this year. I've mentioned in countless other reviews, that I'm not a fan of all of them because of their tendency to be super dry. These by Milani are DRY! These come in 28 colors! From very light shades to darker ones as you see here. These also come in a Metallic formula! I bet those are better, but I haven't read any reviews. I quickly linked a couple of other reviews, so you can weigh your options (here, here, and here). I noticed some patchiness in their lip swatches as well. As with fashion, beauty companies are expected to come out with new products OFTEN. Personally, I think they're coming out with way too much. MAC has gone ballistic with their collections. This year, I've witnessed really good makeup companies sacrificing the quality of their products for quantity. It's truly sad to see. Beauty enthusiasts are recognizing these problems and are more cautious now with their purchases. Woooow, I thought I had read that wrong, 28 shades?!? That's massive for a drugstore release, and makes it so much more saddening that the formula is bad too. Hopefully they get on top of it and make some improvements because even just the 3 shades you've shown are beautiful colors and I'd love to see such a big range and amazing brand do the formula some justice! Too bad these do not work for you! I tried the Allure colour and it worked fine, it didn't dry my lips like other liquid lipsticks I tried in the past and the colour is amazing, more of a spring shade! These three shades you got look great, too bad about the formula! That's too bad about the quality of these, Kim:( But dang...you look so great in these three shades! I usually do like Milani and am quite disappointed to hear about this new release. And I agree about these new releases from beauty companies! I find MAC has one, like....what? Every week! :P I exaggerate, but you know what I mean. Everytime I go to Sephora, the new products always overwhelm me. Beautiful review, Kim. And now I am glad I didn't get them. I bought quite a lot of the brilliant and shine lip glosses by Milani and boy was I disappointed. They are so sticky and they don't last even as long as an hour, tho. That's a shame! I heard a couple of people liked this formula so I wonder if it varies by shade. I like you in that bright middle shade! I've never tried Milani products specifically, but I am always very wary of liquid lipsticks in dark shades - I find they're incredibly hard to apply evening and always dry down to an odd, patchy finish. I've had the same problems with Color Pop and Smashbox. Thanks for an honest review, Kim! The colors look really pretty so it's a shame there was such a huge misstep with the formulation and packaging. I understand that companies have to continually come out with new products but to put quantity over quality is never a good way to go and that goes for us as consumers as well. I know I'd rather have one good lipstick than 10 crappy ones. Thanks for your honest thoughts Kim! I am so disappointed to hear this. I love Milani... their blushes and regular lipsticks are great, and even some of their mascaras are good in my opinion. I hope this will not be a trend for their brand. Total fail from what I read Kim - and like you say, its awful they are sacrificing quality for quantity. Oh bummer! I have been looking for this lip cream in the color Lovely because it looked so pretty! I think I'll skip now as I hate patchy lip products! Thanks for the honest review! Aww, I really like these! Might also try them! That's such a shame that the formula isn't good on these because the colors are so beautiful! You can defiantly see the patchiness, especially on the burgundy and brown shades. I've always loved Milani, especially their baked blushes, but I, too, have noticed a change in their product lip formulas. Thanks for sharing your honest thoughts with us, beauty, and I hope you have the most amazing week ahead! I haven't heard very good things about these either, and that's such a shame because the shades you have are so pretty! I was be annoyed with them drying patchy and being uneven! Dry is the main reason I haven't tried the matte lip trend too! Worried they'd have the problems you've shared here, such a shame all 3 are like that as the beautiful colour is well beautiful on you haha! Oh no, for some reason they look kinda pasty to me. Thank you for your honest review, Kim! I can always count on you. Btw, I noticed you're on Snapchat a lot. I deleted the app because one day I saw this cat filter, and I freaked out. LOL! Anyway, will activate it soon so I can see your snaps. Okay, to be honest, I'm actually glad to hear that these aren't good lol. I have been wanting them forever but whenever I spot them in stores, they're all opened or sold out >:( At least now I know that I'm not missing out! It's a shame though, cause the colors themselves are really gorgeous :) Dearest in particular looks soo good on you! What a shame - the colors look lovely but I wouldn't be able to deal with uneven application and patchiness! it's a shame because these are beautiful colors. my favorite colourpop ultra satin lip dispenses a lot of product as well, but it's very forgiving. it doesn't dry super fast allowing you to wipe and correct. Love this lipstick. It doesn't flake and goes on wet. When it dries it looks absolutely beautiful. I love it. Milani is really good with most of their products. I've been satisfied with multiple purchases.